Inder Loves Folk Art: KCW Update - Class Picnic Blouse. Well, yesterday was day 3 of KCW, but the first night I was actually able to sew. And behold! A finished object! I started this on Sunday, so it wasn't all sewn in one night, but it is a really easy and fast pattern (I had forgotten how easy - now I want to make more!). So here is a quick and more formal review. Fabric: Beautiful shirting-weight woven gingham from Britex. This is one the nicest quality ginghams I have ever had the pleasure of working with. Fine weave, smooth, a little glossy, and presses perfectly. The color is a lovely bright blue. I think it was ungodly expensive, but luckily my powers of denial and forgetfulness are strong. Sadly this is all I have of it besides scraps. First time? Nope, this is my second version of this pattern. 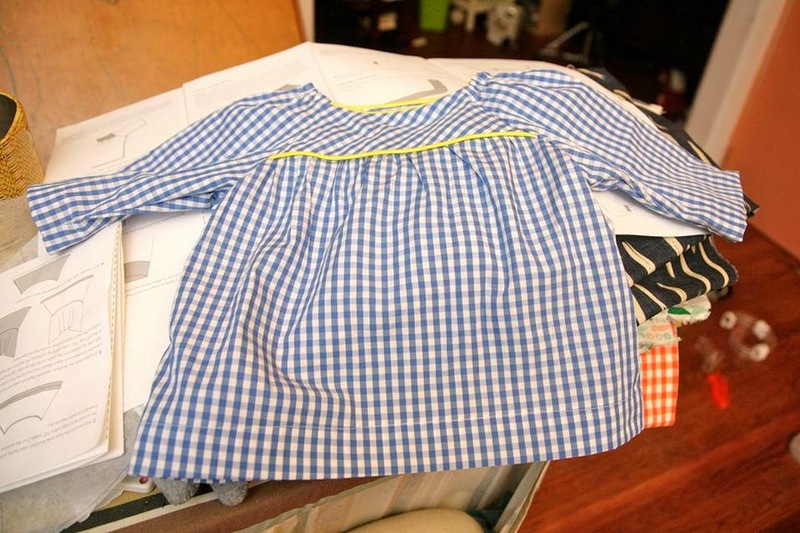 The first was also gingham, with a bias bodice and contrasting piping. I just liked it so much! Size: 18-24 months (likely to be a bit big on my 2 year old peanut, Maggie). I will take modeled pictures when I can. Modifications: Cut bodice on the bias (the lining is on the straight grain to hopefully avoid the bodice stretching too much), added piping to the neckline and bodice, hand tacked the bodice lining on the back (rather than topstitching), used contrasting bias tape on the sleeves rather than self bias. The good: This is an easy and fast pattern and it is absolutely darling on. The instructions are helpful and really walk you through the sewing process. Highly recommended! The not-so-good: Can't really think of anything! I do remember that in the smaller sizes, it is very difficult to hem the sleeves. This wasn't so tough in the 18-24 month size. Applying the bias binding to the sleeve tops is a bit tricky and mine isn't perfect, but after you've inserted the elastic, most minor issues become invisible. Make again? Yes!! I had forgotten how much I like this pattern! Perhaps I will branch out next time and do it in something not gingham. I also started the Class Picnic Shorts last night. This is my first time sewing this pattern, and I love the surprising little details - I always learn something from Oliver + s! They are coming together nicely, although I am having doubts about using contrast white topstitching on bright blue linen. We shall see. How is your KCW going? Oh Inder, its just lovely! Piping and gingham, utter sweetness. I love this! And I love this pattern. I think it was the second Oliver+S pattern I tried (after the bubble dress) and I need to come back to tho shirt this fall before E outgrows these smaller sizes. Look forward to seeing the rest of your creations!